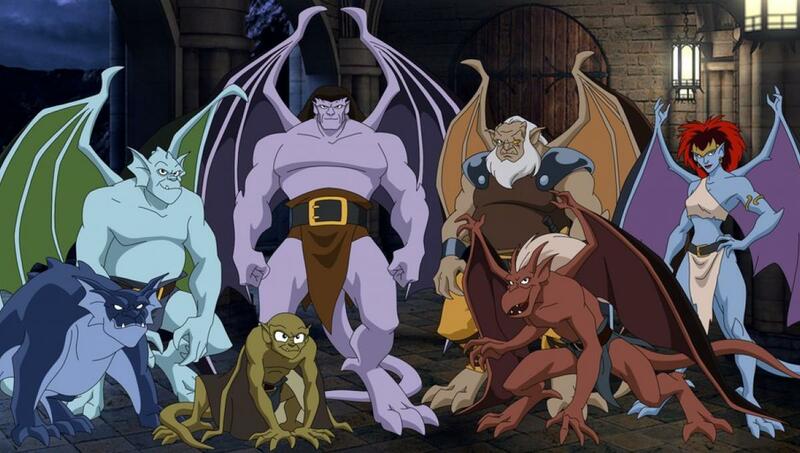 Had a random thought today about how would Disney's Gargoyles look like if written for Fantasy AGE. After about 10-20 minutes of writing based solely from my memory of the show, this is the result. I could of spent more time writing a full description, including details on the different forms and sizes gargoyles can take. But I thought it would be best to make a short post and spend time on other projects...like AGE of Tamriel. For those wondering about that, I am still writing it but I am also trying not to completely burn-out on it. Just having a hard time fighting the urge to write up new mechanics for every little thing. But it is slowly coming along. Pick one of the following ability focuses: Constitution (Stamina) or Willpower (Courage). You have Dark Sight out to 20 yards. You have Glide Wings and a Glide Speed of 10 (minus armor penalty if applicable). You can only glide for 1 minute before needing to land and rest for a number of minutes equal to 10 + your Constitution (minimum of 1 minute). You have Talons that allow you to deal 1d3+1 damage with your brawling attacks. In addition, you can choose to either deal non-lethal or lethal damage with your brawling attacks. You are Threatening. You can perform the Threaten combat stunt for 1 SP. You enter into Stone Hibernation at dawn every day. You turn into a solid stone statue, regardless of wherever and in whatever position you are currently in. While in this state, you are unaware of your environment and cannot move, and you do not need to breathe, eat, or drink. Your Defense is 10 and have an Armor Rating of 4. After awakening from this hibernation, you fully recover all Health and any natural poisons that were affecting you. You die if are reduced to 0 Health while in this state. You can speak and read the Common Tongue and Gargoyle. Roll twice on the Gargoyle Benefits table for additional benefits. Roll 2d6 and add the dice together. If you get the same result twice, re-roll until you get something different. I like 5th Edition Dungeons & Dragons, but I haven't done much in the way of writing more material for it, other than random characters as a means to learn the rules. So here is a fighter martial archetype and a sorcerous origin. This is essentially the eldritch fighter martial archetype re-worked to have the warlock's pact magic and invocations. While I like the concept of a fighter with some dark magic, I don't think this archetype really brings anything new that a multi-class fighter/warlock. The Fel-borne sorcerous origin gains their powers from a fiendish bloodline or possessing spirit. The idea originally came from the Mchawi wizard class and Barozi template from Atlas Games' Nyambe, a fantasy Africa setting for the D20 System. A few months ago, I was playing the game Darkest Dungeon while watching Matt Colville's YouTube video talking about playing in a West Marches-style game. 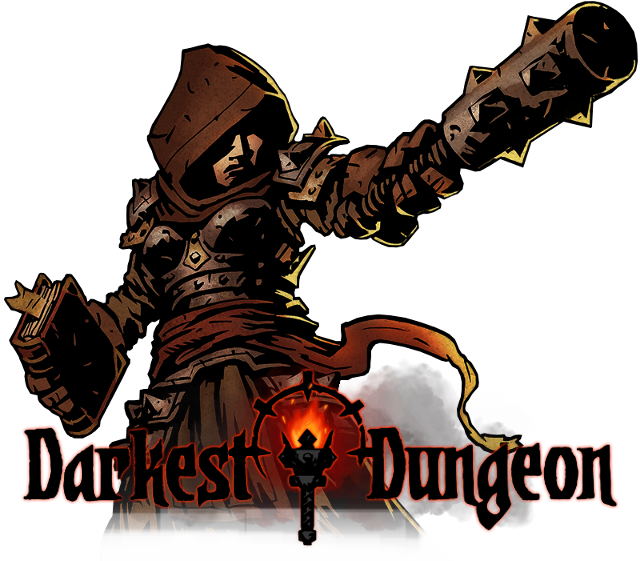 Now admittedly, I have not run/played in a West Marches-style game, but from my understanding, it seems like the Darkest Dungeon setting might mesh pretty well it. I mean, you have a town that as the heart of the setting, a roster of characters for players to choose from, several different dungeons to explore, and a continually influx of new adventurers to replace the fallen (which makes it easier to explain a new player's character showing up). All that with the ultimate goal of trying to get a high-level party to explore the final dungeon. and the usual material covering new character classes, magic items, spells, monsters, etc. Eventually I drifted away for various reason. Thinking back, I had written down quite a bit. Maybe one day I might go back to finish writing it all. But with all that said, I'd thought I'd share something. So here is the Vestal, a sub-class of the Cleric. Now, this sub-class would certainly be more powerful than the regular cleric class of a standard Basic Fantasy game. But in a Darkest Dungeon game, where all the character types are sub-classes with their own unique abilities, not so much. I have a bit of a love/hate relationship with Fantasy AGE. On one hand, I like the system's straight-forward mechanics, how easy it is to write for, and I really like the High Swale setting in the back of the book; remind me of TSR's old Thunder Rift setting for AD&D. On the other hand, I hate the lack of support it has been given (or lack thereof), how its magic arcana system makes it hard to have a D&D-style wizard with many spells, and wishing they would open the system up to third-party support. In writing AGE of Tamriel, I have had a hard time wracking my brain on various issues of trying to bring the Elder Scrolls setting to Fantasy AGE. Once I had decided to fit Tamriel into the AGE system, instead of the other way around, I found it much easier to write for. However, as one can see how long it has been since my last AoT post, I haven't had the motivation to keep writing for it. Lately I have been trying to change that. So here is my write-up for vampirism for AoT. 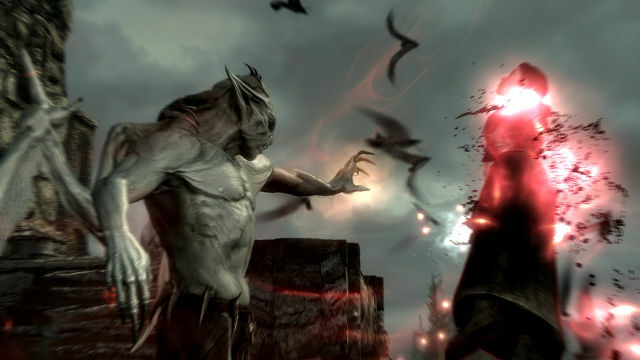 My idea for vampirism is to treat it as a talent, with a vampire-related specialization and two additional talents for those wanting more vampiric powers. My impressions of these rules tell me that they seem very overpowered, especially if all talents are taken. Hopefully I can trim down that power and make it more balanced. Out of all the schools of magic in AoT, Destruction has the largest list of spells. Most of the spells are elemental in nature, and many of them are just variations on base spell form (X Weapons, X Storm, Wall of X, etc). While that made it easier to write, it also made the school feel rather bland. So, I tried looking at the earlier Elder Scrolls games for ideas for non-elemental spells. From what I have read, most of the earlier spells also fell into that variation-on-a-spell trap. But I did add a few unique spells into the mix, so at least there is some variation within the school. Quick post about my AGE of Tamriel project. It is coming along okay, if a bit slow. Spent most of the time writing out all the spells for each school of magic, as well as tidying up the specializations. I have also added some small rules for item durability and repairing items. Plus the usual minor edits here and there. Anyway, here is a preview detailing the spells for magic schools of Alteration and Conjuration. What is Tools & Coconuts? Tools & Coconuts is a hack of Ray Otus's Sorcerers & Sellswords (which itself is a hack of John Harper's Lasers & Feelings) that whisks you away to survive on a tropical island. Will you last long enough to be rescued? Or die from exposure, starvation, dehydration, a wild animal, or a poisonous plant? Play and see! Tools & Coconuts is the product of a night spent reading over Lasers & Feelings, Sorcerers & Sellswords, Tactical Waifu, and few other L&S hacks. During that time I kept imagining quite a few different ideas for my own L&S hack. Even as I lied in bed, I still was having game ideas; an Indiana Jones/Tomb Raider hack, a Redwall hack, Disney's Gargoyles. When I sat at my computer this morning, I decided to write out one of my ideas: a L&S hack about wilderness survival. But as I started writing, I focused on the tropical island scenario rather than an all-encompassing survival hack. T&C uses much of the text from Ray Otus's Sorcerers & Sellswords. Except for how you create a character and rules for sorcery, T&C pretty much uses the text from Ray Otu's Sorcerers & Sellswords, just re-written to better fit the theme of surviving on a tropical island. For a good idea on what I was going for, try watching the tv show Gilligan's Island, and the movies Cast Away and Six Days, Seven Nights. Or if you are particular to video games, try playing Stranded Deep. It has been brought to my attention that I am missing my old Zaheer character write-up for 5th Edition D&D. A little over a year ago, my original site had some issues with it and I lost everything I posted. Well, the posts for my old blog, I still have earlier drafts of everything I've posted. So I spent the morning re-writing Zaheer. I also created a PDF as well. 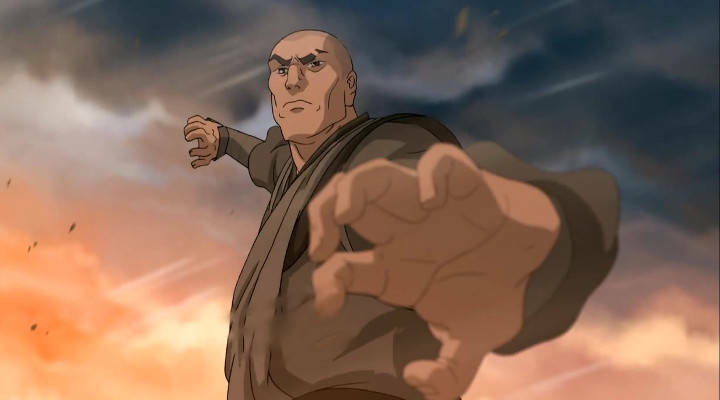 Screenshot from Nickelodeon's “Avatar: The Legend of Korra". Hit Points. 69. Hit Dice. 11d8. Speed. 60 ft. Initiative. +3. STR 10 (+0), DEX 16 (+3), CON 12 (+1). INT 12 (+1), WIS 14 (+2), CHA 12 (+1). • Saving Throws. Strength +7. Dexterity +7. • Skills. Acrobatics +7, Insight +6, Persuasion +5, Religion +5, Stealth +7. • Tools. Artisan's tools (Calligrapher's supplies). • Weapons. Simple weapons, Shortsword. • Languages. Common, Celestial, Draconic, Elvish. Feats. Athlete, Mobile, Polearm master. Senses. Normal. Passive Perception 12. • Quarterstaff. Melee attack +7. Damage 1d6+3 bludgeoning (versatile 1d8+3). • Martial Arts. Melee attack +7. Damage 1d8+3 bludgeoning. • Human (variant). Ability scores (+1 Dexterity, Wisdom). Bonus skill (Persuasion). Bonus feat (Athlete). • Acolyte (background). Skill proficiencies (Insight, Religion). Languages (choose any two). Feature (Shelter of the Faithful). • Unarmored Defense. Armor Class 15 when wearing no armor, nor using a shield. — Can use Dexterity instead of Strength for attack and damage rolls while unarmed or with monk weapons. — Unarmed damage is 1d8. — After using the Attack action with an unarmed strike or monk weapon, can make one unarmed strike attack as a bonus action. —Flurry of Blows. After using an Attack action, can spend 1 Ki point to make two unarmed strikes as a bonus action. —Patient Defense. Can spend 1 Ki point to use Dodge as bonus action. —Step of the Wind. Can spend 1 Ki point to use Disengage or Dash as a bonus action, and double jumping distance. • Unarmored Movement. When not wearing armor, nor using a shield, Speed increased by 20 ft. Can move along vertical and across liquid surfaces without falling. —Elemental Attunement. Can spend 1 Ki point to briefly control elemental forces. —Fists of Unbroken Air. As an action, can spend 2 Ki points and have one enemy within 30 ft. make a Strength saving throw. On a failed save, target takes 3d10 bludgeoning damage, plus an extra 1d10 damage for each additional Ki point spent, and push target 20 ft. away and knock it prone. Takes one-half damage on a successful save and not knocked prone or pushed back. —Ride the Wind. Can spend 4 Ki points to cast the fly spell on self only. —Rush of Gales. Can spend 2 Ki points to cast the gust of wind spell. • Deflect Missiles. When hit by a missile from a ranged weapon attack, can use Reaction to reduce damage by 1d10+11. If damage is reduced to 0 and missile is small enough to hold in one hand and have one hand free, can spend 1 Ki to make a ranged attack with the caught missile as part of the same Reaction. Treated as a monk weapon for the attack. • Slow Fall. As a Reaction, can reduce falling damage by 55 ft.
• Extra Attack. Can attack twice with the Attack action. • Stunning Strike. After hitting a creature with an unarmed strike or melee weapon attack, can spend 1 Ki point to attempt a stunning strike. Target must succeed on a Constitution saving throw or be Stunned until the end of next turn. • Ki-Empowered Strikes. Unarmed strikes count as magical for purposes of resistances and immunities. • Evasion. When subject to an effect that allows a Dexterity saving throw for one-half damage, on a successful save no damage is taken instead and only one-half damage on failed save. • Stillness of Mind. Can use action to end one Charmed or Frightened effect on self. • Purity of Body. Immunity to disease and poison. Starting Ability Scores. 15, 13, 12, 12, 12, 10. Been spending the last few days going over the rules for special materials, not to mention which materials from the Elder Scrolls games I wanted to include. Initially, I tried to give flat modifiers, but with how minimal Fantasy AGE details arms and armor, I found it quite difficult to make each material feel unique. After some time thinking (and looking into FA's magic rules), I decided to try to connect each material to a combat stunt, leaving flat bonuses to those the most powerful, or I didn't have a good idea for. The Elder Scrolls setting has several unique materials in which arms, armor, and other items can be crafted from. These special materials can be used to create Masterwork items, items that are superior to your everyday items. Special materials come in four grades; Common, Uncommon, Rare, and Legendary. An item's grade determines how hard it is to craft, a character must have an equivalent degree in the Master Crafter talent to work with the material. The only Legendary material is Daedric, it cannot normally be crafted by characters, it is included here for completeness. Outside of crafting, Uncommon and higher Masterwork items should be acquired as loot during adventures, or as rewards. A place of sporadic posts on roleplaying games, and anything else that captures my interest. My own hack of Ray Otus's "Sorcerers and Sellswords" and John Harper's "Lasers & Feelngs" about surviving on a tropical island.